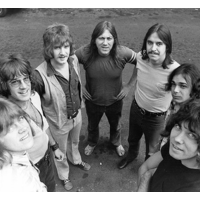 Chicago is an American rock band formed in 1967 in Chicago, Illinois. The band began as a politically charged, sometimes experimental, rock band and later moved to a predominantly softer sound, becoming famous for producing a number of hit ballads. They had a steady stream of hits throughout the 1970s and 1980s. Second only to The Beach Boys in terms of Billboard singles and albums chart success among American bands, Chicago is one of the longest running and most successful pop/rock and roll groups. Chicago re-teamed with producer Phil Ramone in October 2010 to begin work on a new album. According to Billboard, Chicago was the leading U.S. singles charting group during the 1970s. They have sold over 38 million units in the U.S., with 22 gold, 18 platinum, and 8 multi-platinum albums. Over the course of their career they have charted five No. 1 albums, and have had 21 top ten hits.